We stock a range of home and beauty products available for purchase at our home-based salon. Gentle cleansing gel is a light-lathering, soap-free cleanser formulated to gently and thoroughly cleanse the skin, remove make-up and excess oil, while maintaining the skin's natural moisture balance. Suitable for all skin types, and perfect for sensitive skin. Directions for use: Gently lather a small amount on moistened hands and massage onto damp face and neck. Rinse thoroughly. Gently cleanses the skin, removes make-up (including eye make-up) and washes away impurities in one action, without drying or irritating the skin. White Tea, a powerful antioxidant with anti-ageing properties, helps to protect against free radical damage. Eliminates the need for toner. Directions for use: For best results, use twice daily (morning and night). Apply to wet skin and massage gently for 30 seconds. Rinse thoroughly. 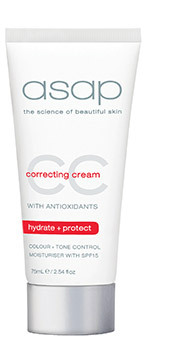 asap recommends the use of asap moisturising daily defence SPF30 as part of your daily skin care routine. Key Ingredients: Glycolic Acid (AHAs), White Tea. 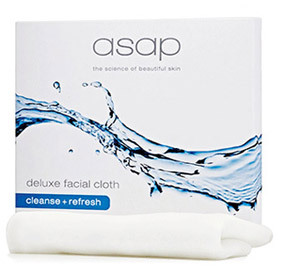 Directions for use: Apply to wet skin after cleansing with asap daily facial cleanser. Massage gently for 30 seconds. Rinse thoroughly. 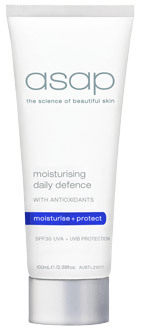 asap recommends the use of asap moisturising daily defence SPF30+ as part of your daily skin care routine. Key Ingredients: Glycolic Acid (AHAs), Smooth round beads to exfoliate the skin thereby promoting cell renewal and revealing fresher, younger looking skin. Directions for use: Apply a small amount to a cotton pad and gently wipe over eyes. Rinse, if desired. A smooth, soft and durable cleansing cloth, gentle enough for even the most sensitive skin. Bacteria-resistant fabric means it is more hygienic than standard facecloths. Directions for use: Wet in warm water then use with cleanser or scrub to remove make-up and impurities. Hand or machine wash in warm soapy water at 40°C. Key Ingredients: Made from biodegradable and bacteria-resistant fabric. A high potency overnight revitalising treatment containing Vitamin A (Retinol), Hyaluronic Acid plus a cutting edge Biomimetic Tripeptide to help diminish the appearance of sun damage/pigmentation and assist with skin tone and texture. Scientifically formulated to reduce the visible signs of ageing and support the production of healthy collagen, leaving firm, smooth and more youthful looking skin. PRECAUTIONS: Avoid use while pregnant / Do not use if taking prescription acne medication / Always use a sunscreen when using a Vitamin A treatment. Directions for use: Apply sparingly in the evening after cleansing. Limit initial use to no more than every other night. Gradually increase frequency of use to every night, as tolerated. For optimum results mix B and A+ serums together. Combine on the back of the hand and apply. Key Ingredients: Retinol (Vitamin A), Biomimetic Tripeptide, Crosslinked Hyaluronic Acid, Tocopheryl Acetate (Vitamin E), Symbiocell™ (Cestrum Latifolium Leaf Extract). Helps regulate sebum production and reduce appearance of redness including acne type skin. Directions for use: After cleansing/exfoliating in the morning, apply a few pumps to clean, dry skin and allow to penetrate before applying other asap serums or moisturisers. May also be applied in the evening after cleansing and before applying other asap serums and moisturisers. Key Ingredients: Niacinamide (Vitamin B3), Crosslinked Hyaluronic Acid, Vitamins B5 and B9, Resveratrol. A unique combination of three of the most powerful antioxidants, Vitamin C (as L-ascorbic acid 20%), Pycnogenol and Idebenone. Scientifically formulated to reduce the visible signs of premature ageing caused by the sun and other environmental damage. Daily use of Vitamin C promotes skin radiance. Directions for use: Apply each morning after cleansing/exfoliating and allow asap super C serum to penetrate the skin before applying an asap moisturiser and sunscreen. Key Ingredients: 20% pure Vitamin C (L-ascorbic acid), Pycnogenol (Pine Bark extract), Idebenone. Combines an anti-ageing Biomimetic Tripeptide, a powerful AHA/BHA blend and a skin brightening botanical extract to increase cell renewal, rejuvenate skin and assist in the reduction of pigmentation, sun damage and acne. Brightens dull, tired, ageing skin, leaving it feeling smoother, firmer and more supple. An effective tyrosinase inhibitor, assists in the reduction of pigmentation. Encourages increased production of collagen and elastin, helping to reduce the appearance of fine lines and wrinkles. Works overnight to help hydrate, repair and regenerate UV-damaged skin. White Tea, Bilberry and Mulberry provide antioxidant benefits and protect against free radical damage. Suitable for Sun damaged and pigmented skin / Fine lines and wrinkles / Acne prone skin / All skin types / Best applied at night following cleansing/exfoliating. Directions for use: Apply sparingly at night as an all over anti-ageing, pigmentation facial treatment. May also be used to treat acne and combat breakouts. Key Ingredients: Biomimetic Tripeptide, AHA/BHA Complex, Bilberry Fruit Extract, White Tea, Mulberry Fruit Extract. Contains AHAs to gently loosen and remove dead skin cells, stimulate collagen and promote cell renewal resulting in younger, fresher looking skin. Directions for use: At night, after cleansing, apply a small amount to clean dry skin. Mature clients may require asap advanced hydrating moisturiser 15-20 minutes following the application of anti-ageing night cream. Key Ingredients: Glycolic Acid (AHAs), White Tea, Lemon Verbena essential oil. Features CoEnzyme Q10, Resveratrol, Retinol (Vitamin A), White Tea and Mulberry. Features CoEnzyme Q10, Resveratrol, Retinol (Vitamin A), White Tea and Mulberry to hydrate, brighten and nourish the skin around the delicate eye area. Contains powerful antioxidants to protect against free radical damage. Directions for use: Apply gently around the eye area, morning and night. Key Ingredients: CoEnzyme Q10 (Ubiquinone), Resveratrol, Retinol, White Tea, Mulberry, Cestrum Latifolium Leaf Extract, Ceramides. Directions for use: Apply morning and night to clean dry skin. Key Ingredients: Vitamin C Phosphate, CoEnzyme Q10, Green Tea, Ceramides. This super rich, nourishing cream with Evening Primrose Oil, Sweet Almond Oil and Shea Butter provides maximum hydration. Primrose Oil, Sweet Almond Oil and Shea Butter, provides maximum hydration, while noticeably improving skin elasticity, tone and texture. Directions for use: Apply to clean, dry skin whenever extra hydration is required. Key Ingredients: Niacinamide, Hyaluronic Acid, Hydrosalinol, Evening Primrose Oil, Sweet Almond Oil, Grape Seed Oil. Light textured, hydrating formulation leaves skin with a light tint and a natural, flawless finish. Contains antioxidants, White Tea and Pomegranate, to help reduce free radical damage and promote radiant, healthy looking skin. SPF15 broad spectrum protection against UVA and UVB rays. May be worn alone or under make-up. Directions for use: Apply in the morning, gently massage into the skin using a circular motion. Avoid contact with eyes. Can be worn alone for a radiant complexion or under asap pure make up. Key Ingredients: Natural Minerals, Zinc Oxide (micronised), White Tea, Pomegranate. 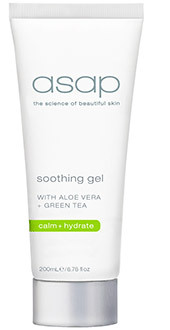 Scientifically formulated to replenish essential moisture, leaving skin feeling soft and supple. Hyaluronic Acid, an effective anti-ageing ingredient, helps to increase hydration and reduce the appearance of fine lines and wrinkles. Contains Niacinamide to support the formation of collagen, improve elasticity and even out skin tone. Provides broad spectrum protection from ageing free radicals and harmful UVA/UVB rays. Directions for use: Apply to clean dry skin every morning and reapply as required. Use alone or in combination with other asap products. Key Ingredients: Hyaluronic Acid, Niacinamide, Titanium Dioxide, Zinc Oxide (micronised). The anti-inflammatory properties of Aloe Vera, Sage and Green Tea promote healing, calm the skin and reduce the appearance of redness. Directions for use: Apply to clean dry skin, use as required. Key Ingredients: Aloe Vera, Green Tea, Melissa Officinalis (Balm mint), Sage, Allantoin. Prevents dry, chapped lips, keeps them in great condition and protects them from the drying effects of wind and weather. Niacinamide (B3) to moisturise and smooth. Alpine Rose to help reduce cold sore occurrence. Bisabolol to soothe lips and accelerate healing. SPF15 to protect against UVA/UVB damage. Directions for use: May be applied with lip colour or on its own. Key Ingredients: Niacinamide, Alpine Rose Extrac, Bisabolol and Ginger, Sunscreen SPF15, Essential Oils, Aloe Vera. This concentrated combination of nourishing oils, powerful antioxidants, vitamins and AHAs, smoothes, polishes, tones and revitalises the skin. Contains AHAs to loosen and remove dead skin cells. Green Tea helps protect skin against free radical damage. Smooth round exfoliating beads promote circulation, stimulate collagen and encourage cell renewal. Refreshing essential oil blend with a light citrus fragrance. Directions for use: Use daily, massaging into wet skin before rinsing off. 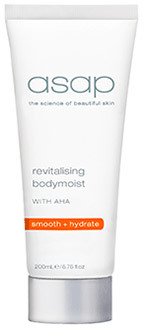 For best results follow with asap revitalising bodymoist. Green Tea helps to protect skin against free radical damage. Directions for use: Apply generously to clean dry skin. 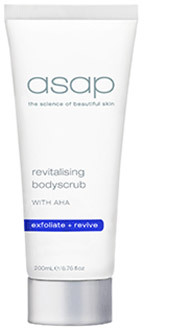 For best results, use after exfoliating with asap revitalising bodyscrub. Key Ingredients: Glycolic Acid (AHAs), Green Tea, Essential oil blend includes Grapefruit, Grape Seed, Olive, Rosehip and Avocado oils. Directions for use: Apply a small amount to the area to be treated. Use daily pre waxing and resume use 24 hours post waxing. Key Ingredients: Glycolic Acid (AHAs), Salicylic Acid (Willowbark), White Tea, Bilberry.